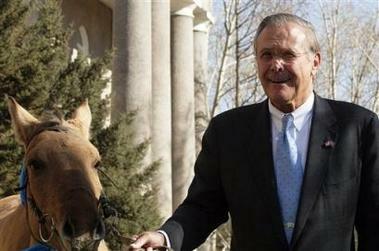 Like a Christmas dream come true, US Defense Secretary Donald Rumsfeld poses for pictures with his new gift horse, Montana. The United States is not looking a gift horse in the mouth with Mongolia, (sorry) President Bush is planning a visit to the country next month. After completing what was widely perceived as a successful trip to China and South Korea, Mr Rumsfeld on Saturday stopped for several hours in Ulan Bator to thank the former communist country for sending troops to Afghanistan and Iraq. Tserenkhuugyn Sharavdorj, the Mongolian defence minister, welcomed Mr Rumsfeld then later presented the first US defence secretary to visit Mongolia with a light-brown coloured, slightly worn horse. Mr Rumsfeld – who described himself to the Chinese as a former “broken down” Navy pilot – named the horse Montana after his impressions of the country from the air. The real purpose of his trip – and that of a planned visit by President George W. Bush next month – to this vast, sparsely populated country was to send a message that the US appreciates the support of even the least powerful countries. Mongolia, which has not lost any troops in Afghanistan and Iraq, currently has 146 soldiers serving in the regions. 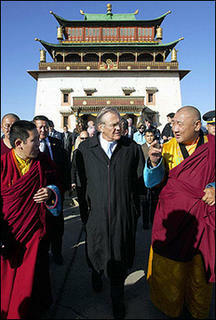 Rumsfeld also visited a Mongolian monastery. 50% of the Mongolian population is nomadic still today. At a news conference, Sharavorj was asked whether China or Russia, its two more powerful neighbors, had expressed concern over his country’s burgeoning relationship with the United States since the collapse of the Soviet Union. “Mongolia wants to establish military relations with all the countries of the world,” he said. “Why should they?” Rumsfeld said, adding that US military assitance was focused on helping Mongolia reshape its 11,000-member military for international peacekeeping missions. Rumsfeld also made stops in Lithuania and praised the progress in Ukraine. New Mongols is just as excited about the visitor next month to Mongolia!